The largest class of the phylum Annelida, containing 68–70 families. About 1600 genera and 10,000 species have been named from worldwide areas; about one-fourth of this number may be synonymous. Polychaeta (meaning “many setae”) is conveniently though not clearly divisible into the Errantia, or free-moving annelids, and Sedentaria, or tubicolous families. The body may be long, cylindrical, and multisegmented, or short and compact, with a limited number of segments. It consists of prostomium (Fig. 1), or head; peristomium, or first segment around the mouth; trunk, or body proper; and tail region, or pygidium. Most segments have highly diagnostic paired, lateral fleshy appendages called parapodia. These are provided with secreted supporting rods and spreading fascicles of setae, or hooks, which display remarkable specificity. The anterior end, or prostomium, may be a simple lobe derived from the larval trochophore, modified as a pseudoannulated cone, or covered by peristomial structures so as to be invisible. Oral tentacles for food gathering may be eversible from the buccal cavity; they may be long, slender, or thick and their surface smooth or papillated. The anterior, preoral end may be developed as a thick, fleshy papillated, nonretractile proboscis (Fig. 2), or the prostomium may be completely retractile into the first several segments and protected by a cage formed of setae directed forward, or concealed by a compact operculum formed of setae of the first several segments. The anterior end of the alimentary tract is muscular or epithelial; it may be covered with soft papillae or hard structures. These structures function for secretion, food gathering, and maintaining traction; they are named for their form or function. The trunk is the main body region and is composed of metameres numbering few to many. They may be similar to one another (homonomous) as in Errantia, or different (heteronomous) resulting in anterior thoracic and posterior abdominal regions. Reproduction is highly evolved and diversified; it can be sexual or asexual. Sexual reproduction is usually dioecious, with the two sexes similar. In rare cases it is dimorphic. Polychaetes range in length from a fraction of 0.04 in. (1 mm) to more than 144 in. (360 cm). Colors and patterns are varied and specific, due to pigment and refraction of light. Littoral, warm-water species may be brilliant and multicolored, whereas polar and deep-water species tend to be drab or sometimes melanistic to almost black. a class of annelid worms, which measure in length from 2 mm to 3 m. The body is made up of numerous (sometimes several hundred) segments, each of which contains an entire set of internal organs. The trunk segments have primitive extremities, or parapodia, which are equipped with numerous bristles. Branched appendages, or gills, are sometimes connected to the parapodia. 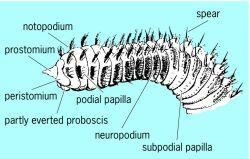 In some polychaetes the function of gills is performed by a circle of tentacles on the head section. The eyes are sometimes compound; there are organs of equilibrium (statocysts). Polychaetes, as a rule, are dioecious; fertilization is external. Development is through metamorphosis: the trochophore larva develops from the egg. Viviparity and asexual reproduction by means of budding are rare. In some polychaetes (Nereidae, Palolo), sharp morphological changes occur when the genital products mature (the parapodia proliferate, supplementary appendages appear), and the worm floats to the surface and discharges its genital products (epitoke). Polychaetes dwell in seas; only a few species live in fresh waters (for example, Manayunkia in Lake Baikal). The class includes about 70 families (more than 6,000 species); at least 700 species are found in the USSR. Most polychaetes live in benthic waters at depths to 10,000 m. They crawl freely along the bottom or burrow into the slime; many build variously shaped tubes from sand or other materials (which some species never leave). Polychaetes feed on detritus. Many species are predators, and some are commensals. Few are parasites. Some species are luminescent. Polychaetes serve as food for many fishes. From 1939 to 1941, Nereis diversicolor, which was the principal food of true sturgeons (Acipenseridae), was transferred from the Sea of Azov to the Caspian Sea. Some large worms (Arenicola) are used as bait in fishing. Some species are fouling organisms and are harmful economically. The Archiannelida and Mizostomida (the latter strongly modified owing to parasitism) are assigned to the Polychaeta. 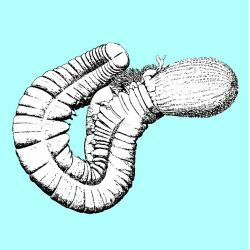 Fossil remains of polychaetes are known from the Cambrian. Rukovodstvo po zoologii, vol. 2. Moscow-Leningrad, 1940. BoVshoi praktikum po zoologii bespozvonochnykh, part 1. Leningrad, 1941. Ushakov, P. V. Mnogoshchetinkovye chervi dal’nevostochnykh morei SSSR (Polychaeta). Moscow-Leningrad, 1955. The largest class of the phylum Annelida, distinguished by paired, lateral, fleshy appendages (parapodia) provided with setae, on most segments. Type-specimens of Annelida Polychaeta in the Museum of Natural History of the Wroclaw University. A new genus and species of Serpulidae (Annelida, Polychaeta, Sabellida) from the Caribbean Sea. Com relacao as classes de comprimento consideradas, Crustacea Decapoda e Amphipoda foram os itens mais consumidos entre as classes 1 e 7 (4,5 ate 14,9 cm), enquanto os individuos acima de 15 cm alimentaram-se preferencialmente de Crustacea Stomatopoda e Polychaeta. The Polychaeta were the most abundant taxonomic group (81%). Descriptions of two new species of polychaeta from Woods Hole, Massachusetts. Polychaeta Myzostomida, Pogonophora, Echiura, Sipuncula. We need in future is donefurther research in the depth up 50 m and work about the animals that they feed on this polychaeta. Polychaeta (Annelida) from the Upper Anisian (Middle Triassic) of Qingyan, south-western China. Las especies presentes correspondieron a 10 grupos taxonomicos: Crustacea (7), Bivalva (6), Gasteropoda (5), Polyplacophora (2), Brachiopoda (1), Echinodermata (4), Polychaeta (4), Hidroozoa (1), Hemichordata(1), Peces (2). This concept with reservation was followed by Signor & McMenamin (1988) in their tentative assignation of Onuphionella to the phylum Annelida and class Polychaeta. Annelida Polychaeta Scolecida Family Maldanidae Axiothella rubrocincta (Johnson, 1901): 10 **, 20. A literature review of the Polychaeta of the Caribbean Sea.